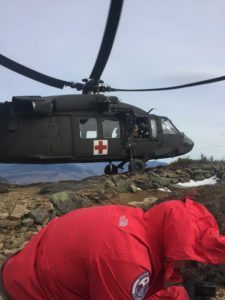 HARTS LOCATION — A 24-year-old Portland, Me., woman had to be carried off the Webster Trail in the White Mountain National Forest on Saturday after injuring her leg on a steep descent. Jennifer Dube was hiking with a companion at approximately 2:30 p.m. when she fell a short distance from the summit of Mount Webster, resulting in a lower leg injury. Multiple rescue services responded to her 911 call, including Fish and Game, Bartlett Jackson and Twin Mountain fire-rescue, the Appalachian Mountain Club, Androscoggin Valley Search and Rescue and Pemi Valley Search and Rescue. 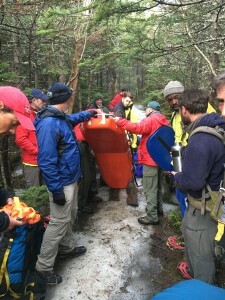 Dube had to be carried approximately 3.2 miles over rough terrain, in a rescue made difficult by snow and ice that covered portions of the trail, along with intermittent rain. She arrived at the trail head at 10:45 p.m. and was transported to Littleton Regional hospital for evaluation and treatment.